Sharp really focuses on the large screens for their LED TV lineup. The LC-70UD1U is their entry into the 4K TV arena. This one actually takes the middle ground in screen size compared to what's already out there. Sony, LG, and Samsung were the first to release their massive 4K screens that came in at 80+ inches. They now have 55 and 65 inch models. Sharp stands alone with their 70 inch 4K LED TV that has 16% more screen space than a 65 inch TV. The LC-70UD1U has received a THX 4K certification as well. That means there are preset picture modes that get have a solid calibration out of the box. It is also easier to make small adjustments to get the picture just right for the space it occupies. The price remains high on this one, but considering the amount of screen space it is a little easier to swallow. Sharp's LC-70UD1U uses edge lighting technology to produce a price and clear picture at ultra high definition resolutions. This type of lighting obviously has its drawbacks, but from a prime viewing spot with the backlight levels in check the picture is excellent. The THX 4K certification is something 4K TVs from all the other manufacturers don't have. This provides a certain amount of trust in the display to provide a stunning picture, and it does. The panel provides a fast refresh rate of 120Hz to get the most out of live sports programming and even gaming. The Aquomotion 240 feature even more to smooth out motion blur and judder, but that is something you don't always want enabled. 4K upscaling is one of the most important features on a TV like this one since 4K content is few and far in between right now. The TV will take the signal of a DVD or Blu-ray player, game console, streaming content, cable, or satellite and convert it to 4K resolution for the display. There is not need to worry about compatibility with all of your present devices. The small Smart Central button on the remote gets you directly to the Internet TV settings. The menu that pops up initially inclueds Vudu HD Movies, You Tube, Hulu Plus, Cinema now, Aquos Advantage Live (support), Vudu Apps,. Netflis, and then scrolling right one time provides access to a web browser, FilmFresh, Skype, USB Media Input, and Home Network. That last one is the favorites section which will change per your choice. CNBC App that's free through the Vudu Apps platform is basically clips from the TV show so a very worth App. There is a list of stocks which can be edited and selected on-screen while watching the clips.Rating: 4.5 out of 5. Discovery – Short Clips from Discovery about 30 of them in all. Rating 2 out of 5. Today – Clips of the Today that experienced an error and would not load. Picasa – 1000 featured Photos on the big screen – unfortunately in 4:3 format so therefore not that great to make your TV a piece of wall art (the TVs aspect button will not stretch). Some of the photos are nice though. Rating 3 out of 5. So the Vudu Apps that are available for free are the other Apps available through Sharps Smart Central TV, they have not bothered to created their own and I'm not sure that I blame them or that is wasnt a smart move to enlist the Vudu Apps and let them do the work. The LC-70UD1U has the new DuoBass speaker set up that provides front facing speakers. The front facing speakers are better at filling a room with rich sound compared to down firing speakers that bounce sound out. The output wattage the same as the 857U models, but the change in configuration really helps things out. A look at the profile of the TV reveals a protrusion on the back of the set. This houses the DuoBass speaker system. Be aware that this cannot be removed for wall mount installations and should be taken into consideration for low-profile wall mounting. 4 HDMI inputs are more than enough for just about any home theater set up. Each input can accept a native 4K signal as well. Once 4K gains traction, the LC-70UD1U will be more than ready to handle whatever ultra high def signal you can throw at it. There are only 2 usb ports on this TV. The $6,000 price tag on the 70UD1U mainly goes toward the large screen size and the THX 4K certification. Those are the two things other 4K TVs out there right now don't offer. 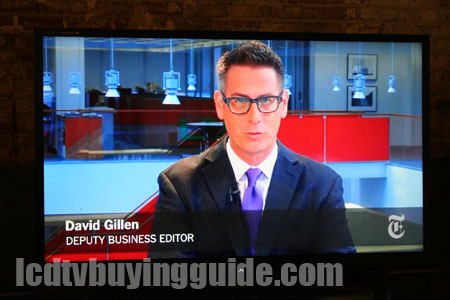 The 65 inch 4K TVs out there right now with similar specs are selling for $1,000 less. Granted you lose 5 inches of screen space, but the features are more robust from Sony, Samsung, and LG models. 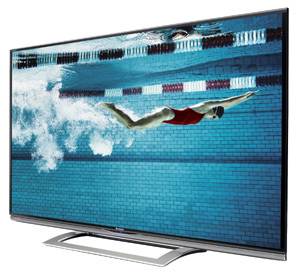 Those models are the Sony XBR-65X850A, the Samsung UN65F9000, and the LG 65LA9650. The Samsung and LG have fully featured smart TV platforms, better speaker systems, built-in cameras, and voice recognition. The Sharp is the way to go for those looking for larger 4K screens. Dimensions without stand (wxhxd): 62-9/64" x 37-13/32" x 4-16/32"
Dimensions with stand: 62-9/64" x 39-7/64" x 16-15/32"
Weight with stand: 121.3 lbs. Weight without stand: 103.6 lbs.